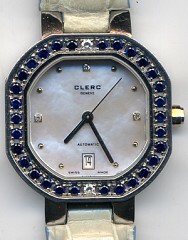 Clerc Ladies SS Automatic With MOP Dial Plus Sapphire Bezel! Light Blue Crocodile strap, SS, MOP diamond dial, Diamond hour markers, Sapphire & diamond bezel, date, 50 meters water resistance, Display reverse, Sapphire crystal, Swiss automatic movement, Deployment clasp, 31 mm x 8 mm thick. Retail approaching $7500 with MOP Dial & SS Deployant...Sell for $2,350 or TRADE!